one dish i was very much impressed was the 香煎米粉. i thought it was really good, crispy very fragrant good wok hae, bee hoon & ingredients inside tasty, not mushy, not burnt. suddenly felt like giving it a try today on 14.5.2016.
took out leftover sotong tentacles, some prawns, chicken breat from freezer & defrosted. had 1/2 chinese cabbage in chillier, 2 leaves turning bad liao. cut 1/3 from the 1/2 & removed the spoiled portions. cut chinese cabbage into very thing strips & fried with cut chilli padi & oil first & fish sauce till soften. added the leaves & fried a bit more then added 1 cup water, turned to low & braised. chinese cabbage was to add veg sweetness as stock (i didn;t have any chicken stock). while cabbage braising (about 15mins), i cut the defrosted prawns, chicken, sotong tentacles & seasoned separately with fish sauce & white pepper. i removed the cabbage with little soup left & transfer to a bowl. then i added butter & fried the prawns, chicken, sotong tentacles maybe 80% cooked. removed them & set aside (i think this step not necessary but i was not sure how much stock to add & whether i had time to cook them before drying out the beehoon). i added oil, onions, chopped garlic into pan & fried till fragrant, turned fire high & added 2 eggs & scrambled. then i returned the stock to the pan added the beehoon (soaked in water & drained) together with the prawns, chicken, sotong tentacles & braised the beehoon. 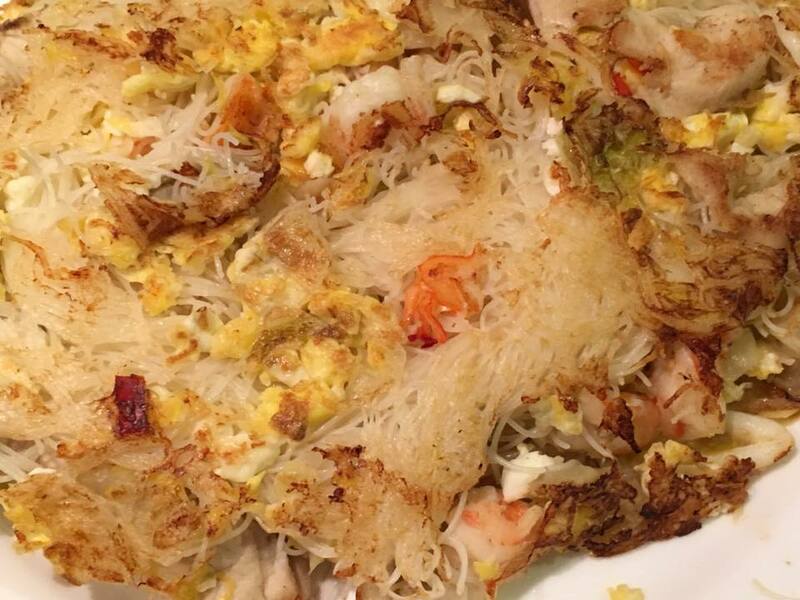 i turned fire to high to dry out the beehoon, then i added the scrambled egg & mixed. 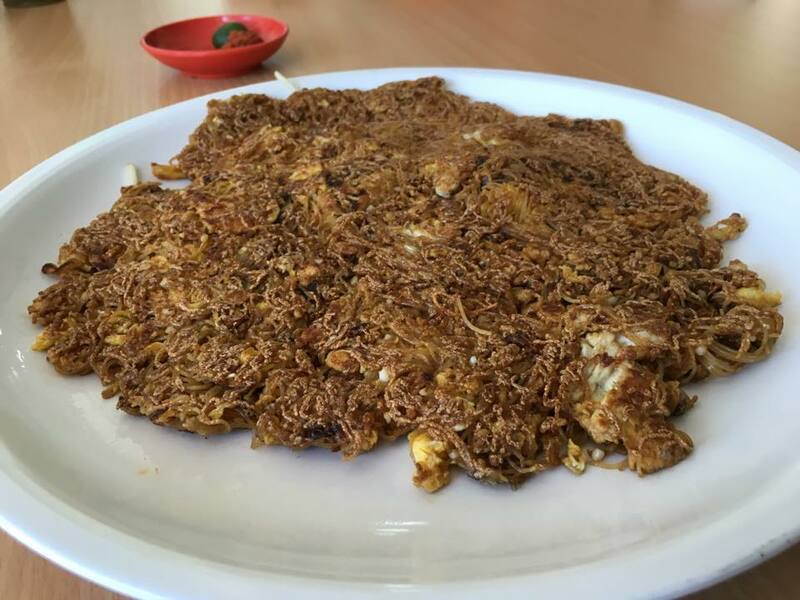 the last step was to make the beehoon crispy. 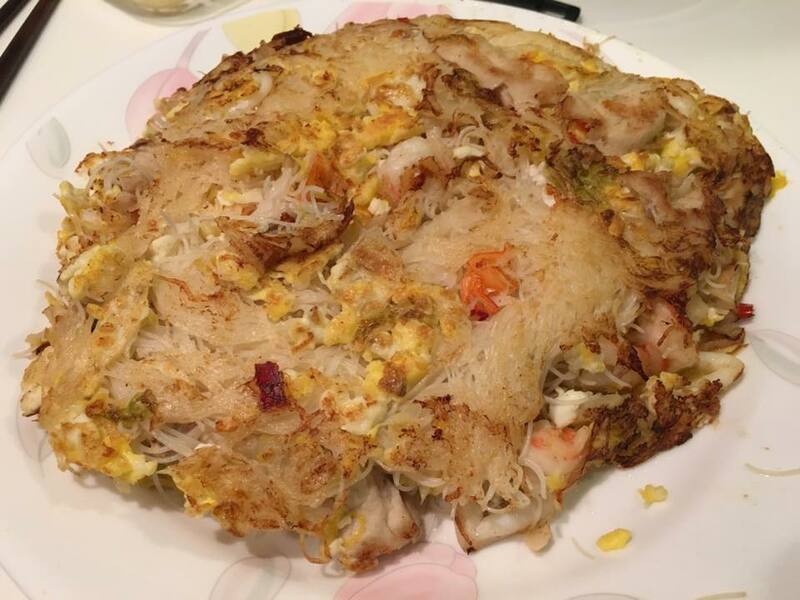 i was able to do it in parts but could not flip over & make it into a pancake presentation. anyway the result was still a very tasty, fragrant, quite excellent tasting beehoon with very good wok hae. anyway now i have a good feel of the dish so can very the steps a little as provided below. add oil, onions, chopped garlic into pan & fried till fragrant. turn fire high & add 2 eggs & scramble. set aside. fry chinese cabbage & cut chilli padi with oil & fish sauce till soften. add 1.5 cup chicken stock, turn to low & braise. reduce to 1/2 cup or so. marinate prawns, sliced chicken breast (or pork), sliced sotong with fish sauce & white pepper. 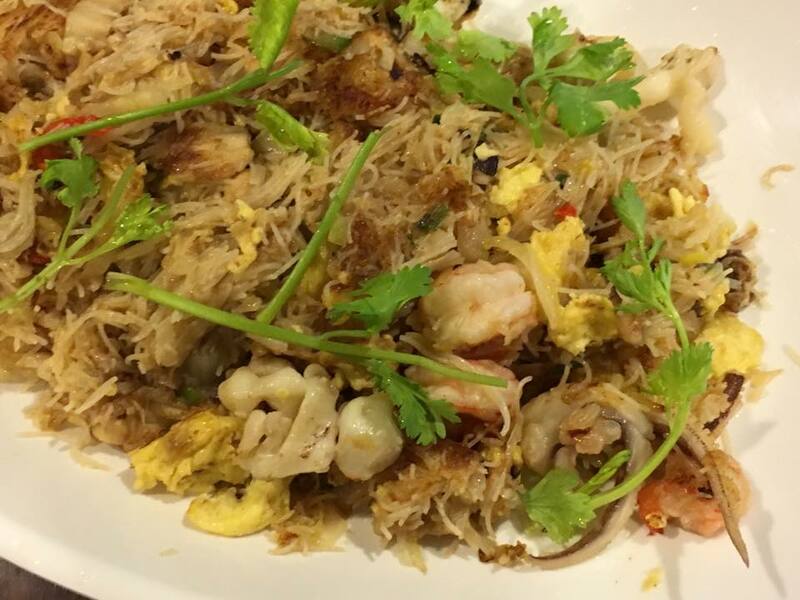 add beehoon (soak in water & drain first) together with the prawns, chicken/pork, sotong & braise the beehoon. 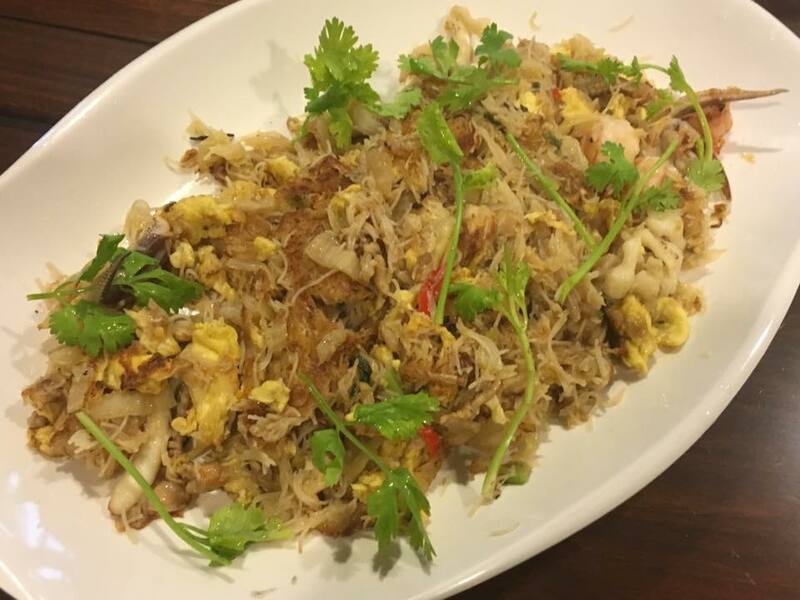 turn fire to high to dry out the beehoon, then add the scrambled egg, cut spring onions & mix. flatten out the beehoon & press to crisp over high fire. flip over if possible. if not, crisp enough parts of the beehoon. garnish with coriander & serve.